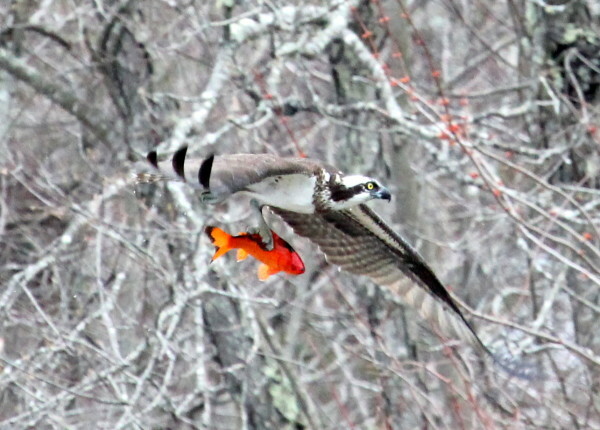 This osprey flew off with a large goldfish in April after diving into The Muck to catch it. BELFAST, Maine — Goodbye goldfish. A majority of Belfast City Councilors decided at Tuesday night’s regular meeting to spend up to $6,000 in an effort to eradicate the rogue goldfish from Kirby Lake, better known as the Muck. Most of the money will be used to rent a long-reach excavator to dredge out the pond, which officials from the Maine Department of Inland Fisheries & Wildlife said needs to be done in order to eliminate the goldfish. “Other animals are being eaten up by the goldfish. They are being eaten up before they mature,” Norm Poirier, the parks and recreation director for Belfast, told the councilors. After the goldfish — some of which are estimated to be as large as two feet long — are gone, the game wardens will stock the pond with brook trout. Then, the Muck will be turned into a youth fishing hole — Waldo County’s first and only such dedicated area. One councilor, though, thought it sounded like too much trouble. “It’s amazing to me that we have to do all this, just to get kids to go fishing,” Councilor Mike Hurley said, reminiscing about his own youthful days of trapping muskrats in New Jersey. He told the other councilors that nobody had to stock muskrats back then. “I’m just not that excited that this is the right thing to do,” Hurley said before casting the sole opposing vote. The work should be done by the spring, Poirier said. A local contractor has volunteered his services at the controls of the excavator and will buy the gasoline for the endeavor, too. In other business, the council decided after lengthy discussion to approve a new layout plan for the inner harbor. Among other points, the plan is designed to allow around 50 vessels of varying sizes to be moored on designated floats in the area from the outer turning basin to the footbridge. Currently, the area supports only about a dozen boats. At a public hearing on the layout plan held before the council meeting, several area fishermen spoke up to encourage city officials to move slowly and carefully when making changes to the inner harbor. Councilors also heard from Jon Finger, the captain of the schooner J.&E. Riggin. He said he recently acquired the 96-foot-long schooner Timberwind, and wants to establish it as a day sailing vessel in Belfast Harbor. “We are very excited about this opportunity,” Finger said. Harbormaster Kathy Pickering told councilors that deepwater is a valuable commodity for everybody who wants to moor vessels in the inner harbor. “There’s not much of it, unless we get dredged,” she said. Additionally, the councilors heard an update on the newly formed Regional School District 71, composed of the communities of Belfast, Belmont, Morrill, Searsmont and Swanville. The new district’s nine-person board of directors will be elected on Jan. 13, according to Larry Theye, the secretary during the transition from RSU 20 to RSU 71. The nomination period is open until 5 p.m. Dec. 11, Theye said, adding that four candidates already had taken out papers in Belfast. Five of the nine positions on the new board of directors will be held by Belfast residents, with one each coming from the other towns. On Monday, Jan. 5, the city will host a forum for the candidates at 7 p.m. at City Hall. City officials also said they will rebuild the antique covered well at the intersection of Head of the Tide Road and Route 7 that was wrecked in November by an alleged drunk driver. Officials anticipate that the driver’s insurance company will pay for rebuilding the well, which has been in that location since around 1880.